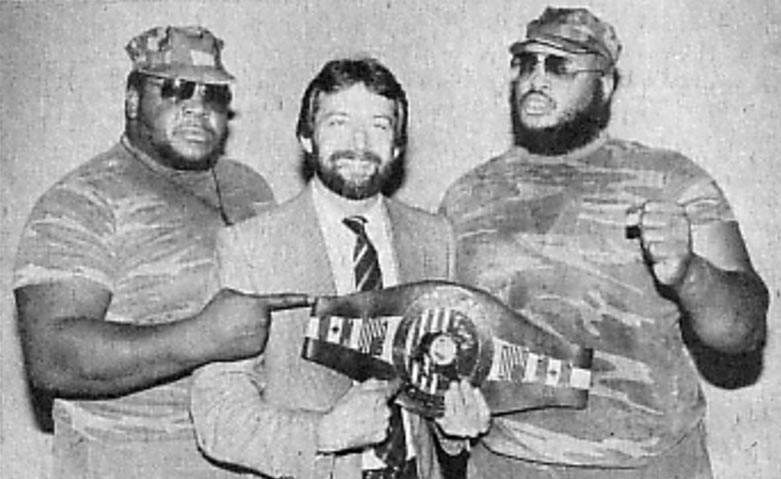 Elijah Akeem was working in Florida as the bodyguard of Sir Oliver Humperdink when Ray Candy came into the territory..
Ray Candy became known as “Kareem Muhammad” and formed a team with Elijah Akeem initially known as the Zimbabwe Express.. The Z-Express’ main rival was Blackjack Mulligan, who had a tough time pronouncing “Zimbabwe” so it was changed to “Zambaui”..
1985: The Zambaui Express worked in Southwest Championship Wrestling and engaged in a bloody feud with the Sheepherders..
Jay Ambler wrote: “Gentleman” Jim Holiday primarily managed the Zambaui Express during their run in Eddie Graham’s Florida wrestling promotion (CWF) in the early-mid 1980s. Besides the Zambaui Express, Holiday also acted as a manager for Abdullah The Butcher when he too did a stint in Graham’s territory. The angle used by Holiday and The Butcher was the offer of $10,000 cash for anyone who could defeat him. Holiday was often seen carrying a briefcase that contained the money. In 1982 or 83 Zambaui Express member Kareem Muhammed (Ray Candy) and Blackjack Mulligan engaged in a vicious brass knucks match that was televised. Mulligan was the Florida brass knucks champion. The match ended up going outside where both competitors used an old parked pick up truck, complete with rope and barbed wire in the back, as a battering ram against each other. Holiday was at the match displaying his hyperactivity that was part of his angle.